Editor’s note: This post was originally published in 2013 and has been updated for comprehensiveness. Waste oil doesn't have to be a burden to plant personnel. Using an oil skimmer ensures that oil will be removed with minimal effort. With the right equipment, a facility can manage the oil effectively while saving time and money. Plant personnel are always looking for new tools and equipment to help them run their facility more efficiently. In many manufacturing and processing plants, oily water is present, which prevents a plant from functioning at its maximum productivity level. Water has several purposes in a manufacturing or processing facility: It can be used for cooling machinery, washing down equipment, or in processing. Sometimes, this water picks up oil or grease from surrounding machinery and equipment. Regardless of whether the facility chooses to reuse the water or send it to the city treatment plant, it has to remove the oil. Some plants, however, are not properly equipped to remove oil effectively. An oil skimmer is an ideal solution. An oil skimmer is a piece of equipment that continuously removes oil from the surface of water. Oil skimmers are used in a wide variety of industries such as steel, biodiesel, manufacturing, food processing, wastewater treatment, and utility. However, not every facility utilizes an oil skimmer. In this post, we’ve included the top benefits of skimming oil, must-have features to look for in your skimmer, and supplementary accessories to perfect the process. The obvious reason to use an oil skimmer is to remove oil from water. Aside from this, there are many critical reasons to employ an oil skimmer. Using an oil skimmer can save a plant both time and money. Read on for seven specific benefits. Removed waste oil can be valuable to other industries that develop products with the waste oil. For example, industries with vegetable oils or animal fats, as a by-product, can provide this valuable oil to other industries to make products, such as biodiesel, soap, and animal feed. Waste petroleum oil can also be recycled and cleaned and then receive additives to help make new petroleum oil. The removal of oil prior to treatment reduces costs and makes the treatment more efficient, often resulting in reduced surcharge. Some plants re-circulate their water after treatment, and others send it to a city treatment plant. It’s an automated process. Unlike time-consuming and costly manual skimming, an automatic oil skimmer continuously removes oil unattended. The cost of an outside contractor to haul away oil is greatly reduced with the installation of an oil skimmer. Since an oil skimmer removes oil and not water, the facility is not charged for hauling away water. Plus, with the container collecting oil without water, it is possible that the oil has value, thus reversing the charge. Using an oil skimmer prevents foul odors. When an oil layer forms on the water surface, it prevents oxygen from reaching the water, allowing anaerobic bacteria to grow. This bacteria causes the odor. If oil is left to build up, it can potentially be a fire hazard. An oil skimmer helps reduce that threat by removing the oil. Skimming can prevent clogs in lines and sprays by removing tramp oil from coolant. Tramp oil removal maximizes the effect and life of the coolant and also increases the life of the tool. Every oil skimmer is designed to do the same thing. However, not every oil skimmer will achieve the same results. There are certain features that an oil skimmer should have to operate at the maximum functional level. Read on for six must-have features to look for in your next oil skimmer. An oil skimmer's removal capacity should match the amount of oil that is generated. For example, a small oil skimmer should not be used to remove oil from an oil spill. The oil skimmer should be able to skim under conditions where floating debris is present. The oil skimmer should not require constant adjustments or supervision in order to operate continuously. This is especially essential for a plant that is faced with minimal staffing. Difficulty and expense of installation should be considered. The oil skimmer should adjust to liquid level fluctuations. The oil skimmer should be constructed of a material that is compatible with the application. In addition to your oil skimmer, there are supplementary products and accessories to aid the oil skimmer. These products are designed to meet plant personnel's unique removal needs. Below are four that should be on your team’s radar. If the skimmed oil is frothy, as found in machine tool coolant, cold rolling mill coolant, or parts washing solution, the decanter gives the solution a chance to separate from the removed oil and be returned to the solution reservoir, which conserves on solution loss and new solution purchases. When the oil does not enter the skimming area for long periods of time, the oil skimmer continually operates to protect against excessive discharge. During these times when there is no oil present, the decanter prevents an accumulation of water in the storage tank. Where oily waste disposal costs and/or oil reclamation costs need to be controlled, the decanter minimizes the quantity of water or solution accumulation in waste storage containers, thereby controlling costs. They not only eliminate the need for expensive bridgework to install the skimmer but they also provide safe and easy access to the oil skimmer. Enclosures protect the skimming components from wind or weather, harsh environments indoors or out, prevent tampering, address aesthetic and environmental concerns, and enclose any leaks or drips. If the application requires, the enclosure can be completely sealed and gasketed to contain Volatile Organic Compounds (VOCs) from escaping into the environment. 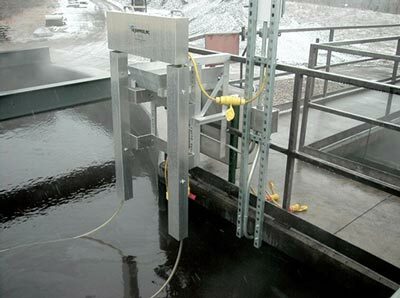 Oil skimmers are sometimes needed in extreme cold weather conditions. Removed oil may need to be kept warm and fluid for processing. The oil skimmer can be equipped with a heat rod, and the sludge tray that catches the oil from the skimmer can be heated as well. If extended reach booms and tanks that are part of your complete oil removal system, they can be heat traced and insulated. For businesses and industries that deal with oil separation and removal, the solution does not need to be expensive or inefficient. Download our free white paper for more on differing approaches to oil / water separation, types of oil skimmers and more.